October passed June in 2016 as the most popular month to get married in the US. That means this Fall lots of newly weds will be joining together to celebrate shared love. Marriage however, isn’t just about bonding two people or families together, you will also be sharing your finances. For the purposes of this article we are going to focus on the financial factors involved in buying your first home together. 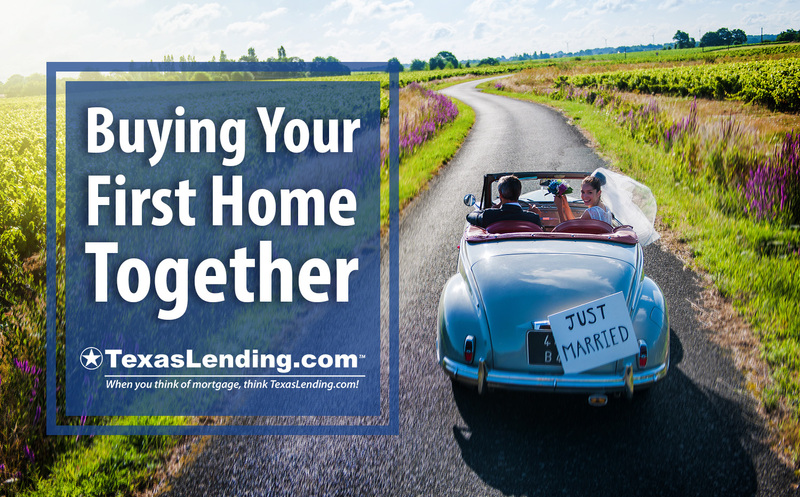 Working together with your spouse can make saving up for a down payment on a home much easier when you are working toward the same goal. There can also be some unexpected financial surprises if you haven’t had an open discussion with your spouse about their financial history. Here are a few mortgage regulations you should consider when buying your first home together. Having a good credit score is a reflection of your responsible use of credit. However if you or your spouse has a low credit score, the low score could prevent you from qualifying for a home loan on a joint application. The lowest score of the two spouses will be considered for mortgage qualification. One spouse can qualify for the mortgage based on their income and credit score, however the community property state laws would still apply to the loan. Texas is a “Community Property State” which means that property obtained during a marriage is shared property. (Both names will be on the deed, even if only one person is on the loan) This also means that when you are looking to qualify for a mortgage, many loan programs will consider the debts of both spouses in their calculations. Your qualification for a home loan is largely based of your ability to show that you can repay the loan. If you are currently renting a home or apartment, you will likely have a good idea about your budget for a monthly mortgage payment. You can read more about how much home you can afford, in one of our previous blog articles. Major life changes like marriage and buying a home effect your taxes. The good news is that, as home owners you benefit from a few tax deductions and benefits when you buy your first home together. We recommend speaking to a tax professional to obtain complete information on this topic. This short list of tax benefits can help you understand a few of the most common deductions. If you own a home in the state of Texas and live in the home as your primary residence, file for a homestead exemption. This exemption will reduce the amount of local property tax you will be responsible for paying. However you will need to file for this exemption through your local tax office in the Fall, before your first full year of home ownership. When you file your federal income tax in the “Married Filing Jointly” status, both you and your spouse can benefit from deductions after buying your first home together. The mortgage interest you pay, as well as the local property taxes, are both deductible from your federal income taxes. If you or your spouse are self employed and work from home, you could deduct your home office expenses. Another possible deduction is available for homes with energy efficient improvements, like the addition of solar panels. Avoid road blocks like changing jobs, making large purchases, or opening new credit accounts. Be responsive to requests from your loan officer and processor. Buying your first home together is an exciting time in your life. We want to give you all of the information you need and help you achieve your goals of home ownership. Reach out to us today to start the conversation about obtaining a home loan.